I was asked to choose photos for seven distinct categories. 1. A Shot That Takes My Breath Away – Highway 22 is one of the most beautiful stretches of road in Canada. It divides the prairie from the Rocky Mountains laying comfortably in the foothills of Southern Alberta. 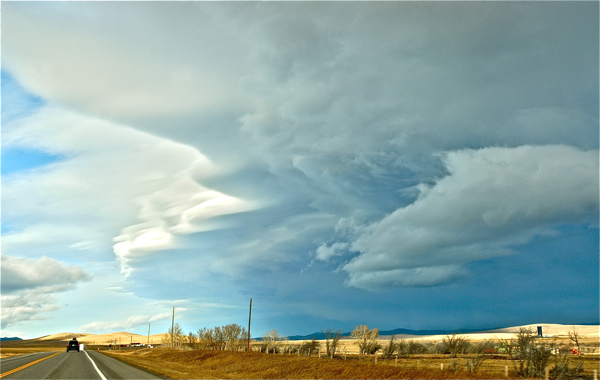 I took the photo as we raced to get ahead of this fast-approaching summer storm. In the end, we lost the race – getting ambushed by hard rain and hailstones. But…I got a nice shot. 2. A Shot That Makes Me Laugh or Smile – What does a popular BC ski town do in the off-season? It gussies up old cars and trucks and smashes them into each other. 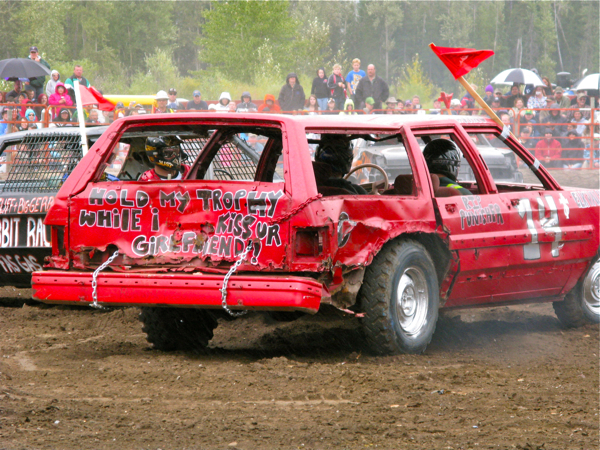 Called Fernie’s most notorious event, the Lions Club Demolition Derby is a 30 year tradition where mud, noise and automobile destruction unite to raise money for community causes. Despite its cheeky message (HOLD MY TROPHY WHILE I KISS UR GIRLFRIEND), this clunker did not finish well. 3. A Shot That Makes Me Dream – This category alludes to “dream” in a figurative sense, but I chose to opt for something more literal. 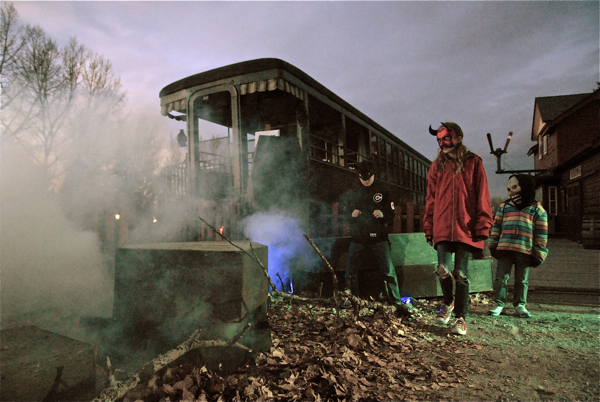 The image was taken at Ghoul’s Night Out – an annual Halloween-themed event held at Calgary’s historic Heritage Park. For a few brief minutes, dusk gifted me with the ideal light to capture this creepy shot. 4. A Shot That Makes Me Think – I spotted this tiny boat builder’s cottage in Lunenburg, Nova Scotia just as a heavy maritime rain was lifting. The setting sun reached out and lit up this colourful, fairytale scene. Many houses in this town, a UNESCO World Heritage Site, have significant histories. I can’t help but wonder what secrets this one has to tell. 5. 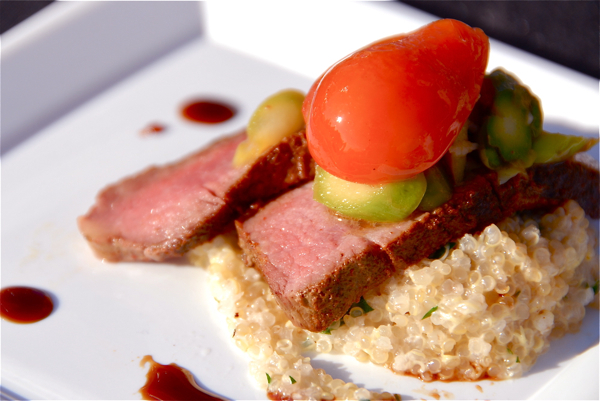 A Shot That Makes My Mouth Water – Kim, a.k.a. Canoe, and I collaborated on many stories BTB (before the blog). This shot was taken during an exciting assignment in the South Pacific. While covering the Maui Film Festival for PostMedia newspapers, we – to put it bluntly – partied a lot. Fresh indigenous food and exotic drinks were a constant temptation. 6. 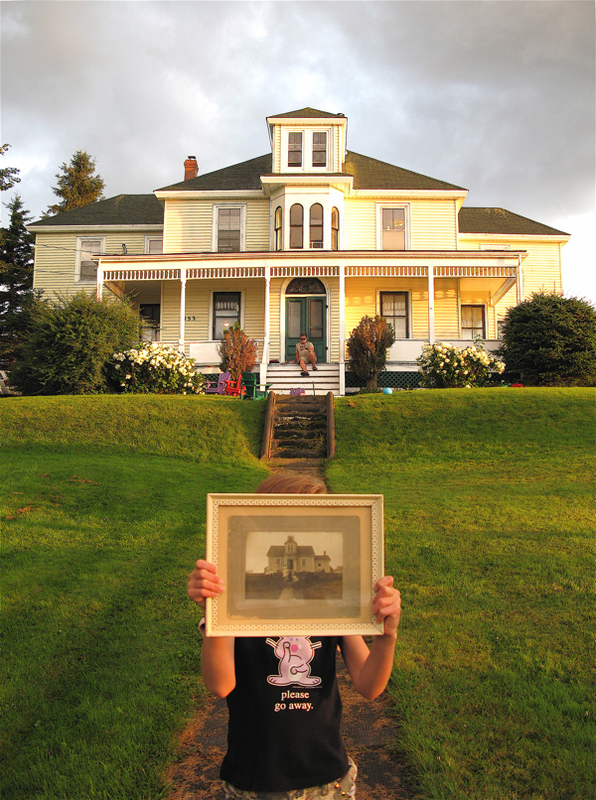 A Shot That Tells A Story – As I previously mentioned, houses in the Maritimes have long and storied pasts. 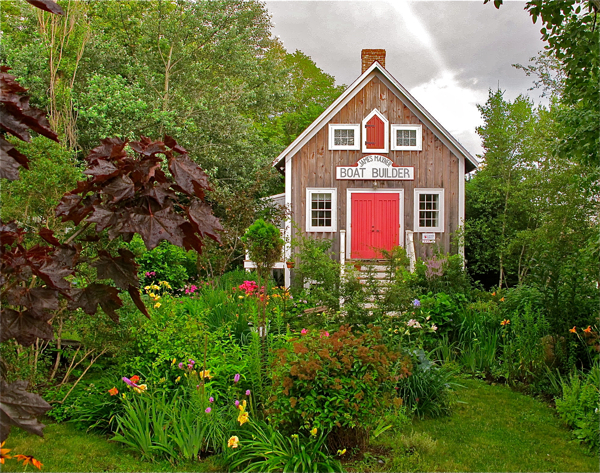 This one in Riverport, Nova Scotia was built in the late 1800’s and was home to several generations of the same family. As the Ritcey family grew and prospered, they built one addition after another onto the house. My photo tells the story of the Ritcey family home – before and after. 7. A Shot That I’m Most Proud Of (aka Worthy of National Geographic) – I have to preface this by saying no creative person thinks they’re worthy of National Geographic. So, in an effort to find a photo for this category, I ignored that part. This photo was taken in Las Vegas while on yet another fun assignment with fellow journalist and biz-partner Kim Gray. We were invited to a party – where we got to hang with the likes of Janie Hendrix (Jimi’s sister), celebrity chef Kerry Simon and rock photographer Robert Knight. Vegas being Vegas, the night involved a private rock concert. 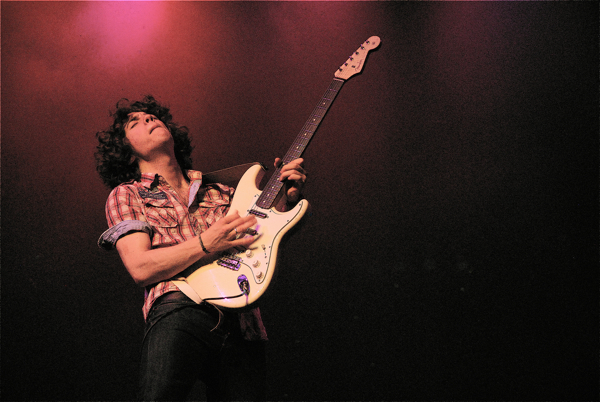 I think this photo of Graham Whitford captures the love affair between a musician and his guitar. 1. Choose a photo for each of the 7 categories above. Awesome shots. I’m having a hard time deciding which one I like best. The food shot feels so real I can touch it, the rocker guy shot is incredible and I of course can’t help but love the shot south of Calgary. You’ve raised the bar and given me something to shoot for. Thanks for participating! Thanks Leigh for the compliments and for nominating us! We should really do some shooting together. You could definitely teach me a thing or two. Cheers! Toque – what an awesome post and shots – I would love to get access to your other 80,000! Well done lady. Favorites – well you know I love the “kiss ur girlfriend” but my other faves are 1, 6 & 7. Ahh indecision..
#6 the Riverport, Nova Scotia house before and after (with its inviting”wrap around” veranda). #7 This photograph has captured Graham Whitford lost in the reverie of his music. It is absolutely brilliant. Whitford is somewhere else. (The composition and coloring including the lost edges of the musician into the background is outstanding – a testimony to the skill of this very talented photographer, Jen Twyman.